Last year, one of my goals was to implement The Daily 5 and The Daily Cafe in my classroom. I was very pleased with the results and how my students responded. I found that by following the routine as recommended in the books really helped my students become independent learners who all worked to the best of their ability. 1 teacher + 18 students with laptops = fun! Another goal was to implement blogging. I was not sure how this was going to work with 2nd graders, but the second week of school, I checked out the portable laptop station from the library and jumped right in! It was hard for some of the students who had never used a laptop, but some of the others were very helpful in getting everyone where they needed to be. I used Kidblog because I was able to set up a separate blog for each student. They used their student i.d. as the password, so it was very easy for them to log on. After a few sessions with the laptops, most of the students were comfortable with how it all worked and were doing short, little posts about themselves. 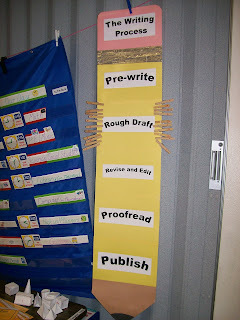 When I felt that they were ready to blog on their own, I introduced the "Work on Writing" component of the Daily 5. During work on writing, they write in their notebooks using the writing process: Prewrite, Rough Draft, Revise and Edit, Proofread, and Publish. When they got to the Proofread stage, they made an appointment to meet with me. They read their work and I listened. When finished, I asked them what changes they could make to their story. Most of the time they were able to pick out spelling and grammar errors, but I guided them in making other revisions that were appropriate for their age level and ability. Once all revisions were done and ready to publish, they moved to the computer to type it all in. At first, it took a long time for the students to type their posts, but by the middle of the year, most were very familiar with the keyboard and were able to get their posts done more quickly. Some even figured out how to do fancy, colored fonts. This handy tool helps keep track of where each student is in the writing process. Once we got to the point where the students chose their Daily 5 round, using blogging for "work on writing" worked perfectly. Since we had three desktop computers, I stopped using laptops because the carts took up so much space in my room. Also, since the students were all at different stages of the writing process, three computers worked out fine. Sometimes the students were so in to their writing and blogging that they wanted to choose "work on writing" more than once per day. I did not usually allow this unless they were really close to finishing. 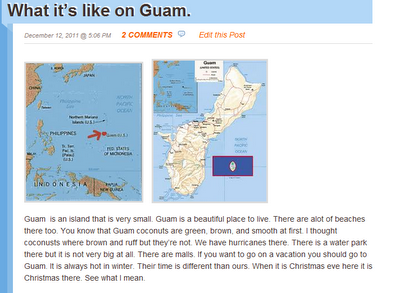 Students engaged and blogging independently. When the students finished their posts, they hit the "submit for review" button. I received an email notifying me that a blog post was ready for my review. Generally, I would just look it over and publish it. I am not looking for perfection, I am looking for good, quality work that demonstrates the students' best effort. They are motivated to do their best because they know they have an audience that includes other teachers, administrators, friends, and parents. When I set up our Kidblog last year, I kept it password protected because I wasn't sure how the parents would respond and I wanted to make sure that I was taking all safety precautions. This year, our blogs will be open so that classrooms around the world can visit and comment. I have it set up so I can moderate all posts and comments. I am looking forward to introducing a new group of 2nd graders to the world of blogging! That sounds awesome! I am definitely excited to look into this possibility. I KNOW my kids last year would have loved it, I can only imagine that my new brood would feel the same this year. Blogging and Daily5 are a perfect fit. Not only can you use it for "Work on Writing" but you could have your students use it for Word Work - They could incorporate their vocabulary/spelling words in a short story or a poem that could be published on the blog. They could also write a book trailer or book review after finishing their Read to Self. There are so many ways to incorporate it. Congratulations for trying 2 new things at once last year. It takes courage to do something like that when you are not quite sure how the pieces will all fit together! Can't wait to hear about how it goes this year! Thanks Nancy! These are great ideas for word work and read to self too! I am looking forward to this next year to see how I can make it even better!